Welcome to another Indeed Podcast. Now with 20% crime solving ability. Today we have Kerry, Keefe, Chris and Matt the Comic guy here to bring you all the crime solving fun. 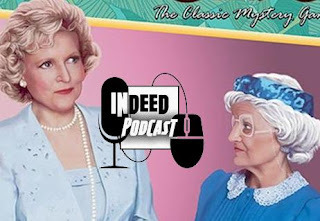 Weekly Roundup we look at the new Clue addition featuring The Golden Girls. You hear me right. Crime with the old ladies of Golden Girls. It's a Golden treat. We also look at some new phone accessories which can help you spy on your kids, or neighbor or whoever. Also a quick look at some IT jobs that may hit the cutting room floor soon. Comic Time we Look at a few new comic to hit the stand but mainly to look at the new one from Dynamite Comics called Hero Killers. Written by Ryan Browne and drawn by Pete Woods. It's a new take on the world of Super Heroes. We think you will enjoy. finally we also look at the first images of the remaster DUCK TALES, which look amazing. Check it out. Sit Back, Relax and put on that thinking cap. We have a crime to solve and we ain't getting any younger. Seriously.....we are like in our upper 70's....time is a ticking. Check out CLOUD SOURCED by Keefe. Hit the big 200. Book one Complete. Also, check out Dark Yeti Games. More and more fun soon to be delivered by them so stay involved. Check out the INDEED PVP server for Ark Survival now live.